wedding day is fast approaching. he can tie the knot—divorce his first wife! Over the last few years I have become of big fan of light, easy, fun murder mysteries. It's the perfect way to relax after a long hard day. You need great characters, a twisted plot, some laughs, some love, some intrigue - and you shouldn't be able to guess the whodunit until the last few pages. Author Lauren Carr offers just that. I reviewed three of her books previously, so when I went on a recent vacation I loaded the entire Mac Faraday series into my e-reader and started over from the very beginning. If you love this type of book I suggest you do the same - start at the beginning and enjoy the ride. In fact is now offering a great deal on the full set of 10 e-books featuring all the previous titles in this series. 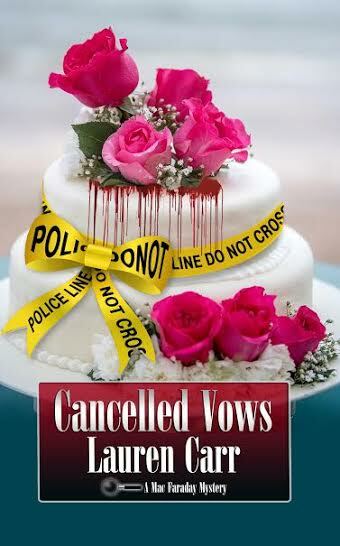 Cancelled Vows is book 11 in the Mac Faraday Mystery series and is every bit as engaging as the previous ten. The plot takes us away from Spencer Inn to New York City. While the initial reason is for Police Chief David O’Callaghan to annul a previous unknown marriage - think Vegas, alcohol and a drive through chapel - a murder occurs while there that pulls Mac in. He just can't resist a puzzle like this. From love to bodies in walls to murder - this newest novel in the series is as intriguing as the last. Where Carr comes up with all her plots, I have no idea. But she continues to offer new and interesting twists and an easy to read style that is perfect for relaxing after a long, hard day.